Interesting podcast idea from NYT: Reporter James Barron describes the three most e-mailed stories every weekday. But once the why-didn't-I-think-of-that novelty passed, a glaring weakness emerged: As I'm listening to the podcast on iTunes (or my new iPod), I can't click to read the stories. Best case scenario for NYT? If I'm listening on the laptop and Barron hits upon a story that I'd like to check out, I have to go to nytimes.com, scroll halfway down their lengthy homepage to find the Most E-mailed module, and hope that the story is still there if I'm listening to that day's podcast (which won't always be the case because I am not yet in the habit of listening to my downloaded podcasts every day, though the recent addition of an iPod to my electronics arsenal may change that). Phew! That's a lot of work. If it's not in that module...? Well, NYT has already lost me. I've got to get back to work. My criticism is in not intended to discourage anyone from podcasting. Instead, it's a reminder that as we experiment with such mediums, we need to be mindful of how the user will interact with it. And you've read this far into my blog post, here's a treat for you: a direct link to the nytimes.com Most E-mailed page. 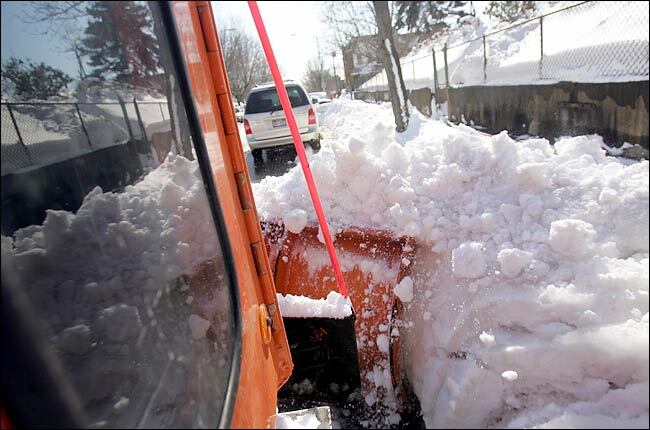 Also, as a complete non-sequitur, here's a cool snowplow photo from Feb. 14.